When packing up to move to Tokyo, there were inevitably a lot of things that had to be left behind. A lot of tough decisions had to be made as I sorted thru everything, trying to keep in mind that at least 50% of everything that I owned needed to go into storage. Some items were not so hard to make decisions on, like holiday decorations. Considering that I was only going to be in Japan for one year, it didn’t seem necessary to bring a Christmas tree, lights, wreaths, etc. I thought the same thing about the storage totes filled with Halloween decorations and all my costume items—“I really won’t need those in Japan, they don’t even have Halloween!” right? Much to my surprise, just weeks after being in the country, Halloween was brought up for the first time. It seemed as though by virtue of being American, it was assumed that I would be dressing up and celebrating. This is NOT what I had planned for. So well over a month before October 31st, it was determined that I, with a group (both Japanese and Americans) would “go clubbing” on Halloween night. And with all of my great costumes and accessories left behind, gathering dust in a storage locker, the plan for what I would wear on Halloween began. 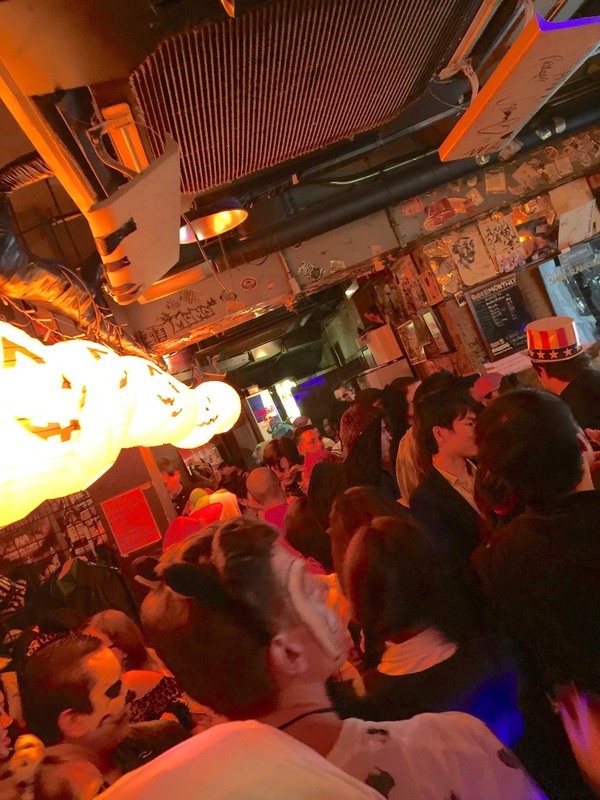 So fast forward to Saturday, October 31st….I, dressed as a mime, board the subway to meet up with friends for my Tokyo Halloween experience. You think in a city like Tokyo where I imagine people have seen it all, that no one would be fazed by seeing a person dressed as a mime on the train, especially on Halloween. But instead, I received a multitude of stares and a few smiles (mostly from children though). We met up in Roppongi, which is a part of town known for being heavily occupied by foreigners and ex-pats. We entered a bar for about $20 which included two drinks and a shot (which was about the size of a serving of cough syrup). Now that we’re in the bar, it starts to become clear that this is not like going to a bar in the US. There are apparently no fire marshals, no occupancy limits, and no general concerns for public safety. In the US, you typically see lines outside of busy bars because they’re full…can’t let more people in until some people leave. This was not the case here. The line that was in front of this bar was simply because the cashier at the door couldn’t take peoples money fast enough! After we paid and received our drink tickets, the door opened and we tried to go in….that should have been my first clue. I literally had to push my way in. After about 20 feet inside the door, the density of the crowd loosened up a bit and you could move a little—that didn’t last for long. Like waves on the beach, the crowd had an ebb and flow to it was that rhythmically SMOOSHING me so tightly against people that I couldn’t even expand my chest cavity enough to scream at anyone. I don’t want to sound overly dramatic, but in all seriousness, there were moments where I felt a bit fearful. It was more like what I imagined the crowd to be like at a really intense street protest for a super important political “thing” (like I see on T.V.). An event where you put your own safety at risk because the “thing” is more important than you—you’re fighting the good fight. Instead, I was fighting for a “space” to call my own for the short time we were there. After a brief war was fought in the area between the front door and a stripper pole, our group was able to claim an area with enough air to breathe freely and the fight for some needed space was won. We enjoyed our drinks and danced to loud music—celebrating our victory. Until we went to a different bar and began the war all over! My night ended at about 4:30 am, when no trains are running and the streets were so crowded with partygoers that the chance of catching a taxi were very slim. So the only option was to take the long walk home. You know, so typical, just a tired, old mime walking the streets of Tokyo before the crack of dawn….I’m sure it’s been seen before, probably a million times!